In Your intuition, seven panes of hand-blown, coloured glass have been arranged at eye-level inside an open metal box, one behind the other, to create an array of overlapping ellipses. Each pane has been tinted a single tone of green, blue, violet, red, orange, or yellow, and a different elliptical section, ranging from a thin oval to a full circle, has been cut out to create a dynamic progression of colour and geometry. The layering of the panes produces myriad tints that shift and emerge as the viewer moves about the work. The elliptical cut-outs allow only highly restricted views of the sheets of glass within. 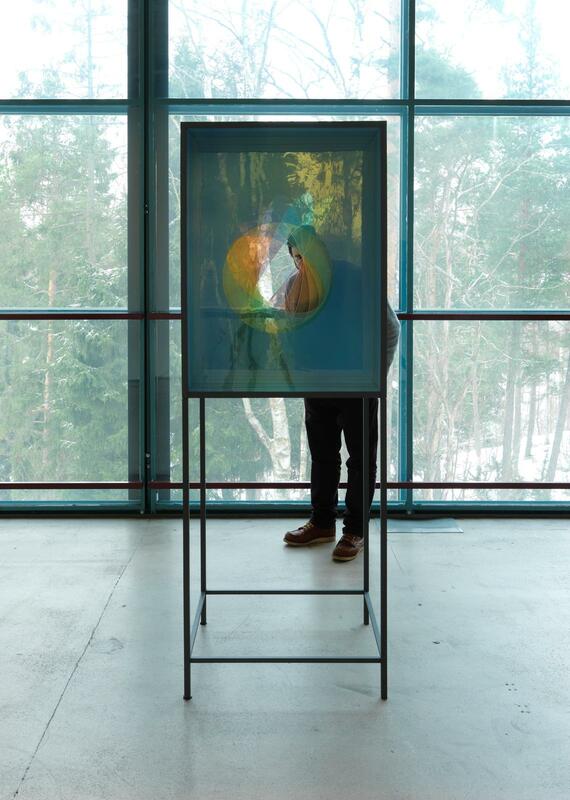 Each pane is visible only through the filtering effect of the others, leaving the viewer uncertain about the actual colouration of the glass sheets. Further, the progression of the ellipses suggests to the mind a two-dimensional evocation of a disc spinning in three dimensions.